I wish I could give this recipe more than 5 stars! Absolutely delicious! I took the advice of some others and only added 1 can of tomato soup, but also put in 2 cans of diced tomatoes. We like spicy food so I added some diced green chiles and a couple of chopped jalapeno peppers. 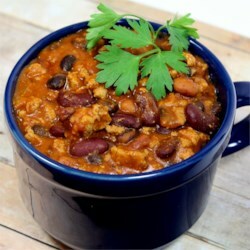 My husband HATES ground turkey, but he had seconds of this chili. Thanks so much for a healthy recipe that tastes like its not! I could seriously eat this twice a week and not get tired of it... YUMMY!! !